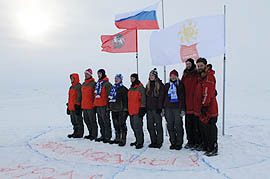 On April 21, 2011 in the afternoon the team of young explorers, participants of the Forth All-Russian Youth Expedition "On skis – to the North Pole" under the guidance of Matvey Shparo and Boris Smolin, had conquered the top of our Planet. On April 15, 2011 seven boys and girls from the six Russian regions started their route from the drifting station Barneo, located in the heart of the Arctic (89° N). The teenagers covered more than 100 kilometers along the drifting ice of the Arctic Ocean in six days. The flags of Russia, Moscow, and the Year of Sports and Healthy Mode of Life were hoisted above the point of the North Pole. The results of the Expedition demonstrated that the discussions concerning the global warming of the Central Arctic are a bit overstated. The young explorers did not meet open water on their route to the North Pole. Just for comparison: the team of the Youth Expedition, which took place in spring 2010, had to swim five times over the wide area of open water, the last lead blocked the route of the team in 700 meters from the North Pole. The Expedition "On skis – to the North Pole" which has become traditional, was initiated and organized for the first time by the Adventure Club of Dmitry and Matvey Shparo under support of the Russian Ministry of Sports, Tourism and Youth Politics. The idea of the Youth Expedition to the North Pole was first suggested by Matvey Shparo and Boris Smolin. The competitive choice for participation in the new Expedition was announced in December, 2010. The schoolchildren of the age 16-18 years (including the teenagers from children’s homes and remedial schools) were offered to answer the questions of the application form. The indispensable condition was the participation in the All-Russian Mass Competition: "Ski Track of Russia '2011", or other Ski Competitions and also experience in outdoor tourist trips. In Moscow the additional stage of selection became the Mayor Cap Competitions in winter tourism among the schoolchildren of Moscow remedial schools, carried out by the State Organization Centre of Supplementary Education of Children "Laboratory of Adventures". More than 50 applications were received from 24 Russian regions. The application forms of candidates were considered by the Jury, including the following high officials: Pavel Kolobkov, Deputy Minister of Sports, Tourism and Youth Politics; Dmitry Shparo, Director of the Adventure Club, the editors-in-chief of the leading Russian newspapers. Finally 40 candidates were invited to Moscow. They participated in the training session from February 27 to March 9, 2011 in the Youth Ecological Camp Great Adventure in Karelia. The team of seven boys and girls was formed, basing on the results of this training session. Matvey Shparo and Boris Smolin, aces of the Arctic crossings, were the leaders of the team of the young explorers. The names of Matvey Shparo and Boris Smolin are recorded in the Guinness Book of the World's Records.